PALEO JAY SMOOTHIE CAFE: Paleo Quick Tip of the Day #78 The ONE most Essential Oil you Must Have! Paleo Quick Tip of the Day #78 The ONE most Essential Oil you Must Have! I know, I know- the whole idea of essential oils is confusing! But trust me- I’m not going to inundate you with dozens of crazy oils you NEED to get for various obscure conditions, and send you into a labyrinth of figuring out just WHAT to do, why to do it, and how it is beneficial- NO! I have ONE SIMPLE SOLUTION. Get the one essential oil that is, indeed, essential- Frankincense oil! This is the “Big Daddy” of essential oils, and if you use it on a somewhat regular basis, preferably in an electric diffuser while you are sleeping, you will be healthier, happier, less stressed, and let’s just say- a new and better YOU! I bought one awhile ago, and it stopped working... I emailed the company, and they IMMEDIATELY sent me a new one, no questions asked! OK, while you are there, be sure to also order some Frankincense Essential Oil- a real distilled oil, not a “fragrance” oil, which is FAKE. Did you know, the calming, mental effects of Frankincense oil are probably its number 1 draw? It stops anxiety, anger and stress; it is also very calming and soothing. It is wonderful for your hair, teeth and gums, and any sort of wound. It is an anti-inflammatory, and is especially helpful in rheumatoid arthritis and cancer! It is also wonderful for oral health- put a drop on your toothbrush and brush away- you will be rejuvenating your oral health. You can rub it on your skin, it will rejuvenate it! You can put it anywhere on your body, and you WILL benefit healthwise! You can put it in a spray bottle with vinegar, and it will disinfect as well as anything on this earth!! As I said at the start, this is the ONE Essential Oil that you NEED! There are others, they have their advantages, Tea Tree and Lavendar are close runners up... but just start with FRANKINCENSE! If you never get any others, no matter- you have the most important. 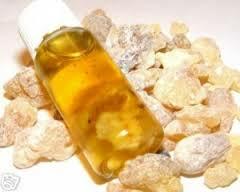 Frankincense: it will benefit you mentally, physically, and spiritually, as they said in the Wizard of OZ... but more importantly, in the Bible!